I keep a food journal when we travel. It’s nothing fancy, just a little book that isn’t my iphone. There are no pictures or charming doodles… there aren’t really even sentences, just scribbles of ingredients and descriptions of what we ate and where. Some dishes, I’ll try to recreate at home, but not all of them. The chosen few that make it off the list and into my kitchen come down to a few components: how badly I crave something, the ability to decipher my chicken-scratch handwriting, and the availability of similar ingredients without having to visit specialty stores. This came together even easier than I expected – no fancy dressing, no cheese, just a good splash of olive oil, sherry vinegar, salt and pepper. 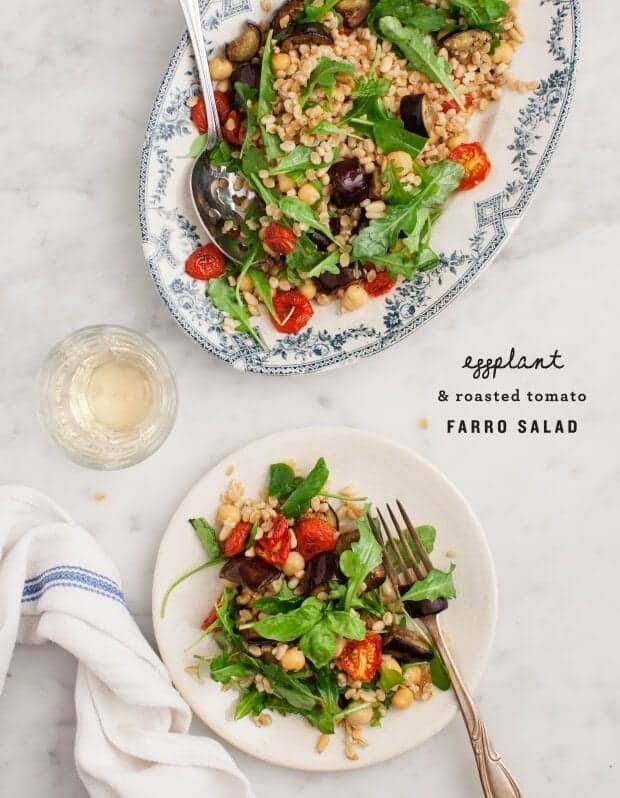 The bright tangy flavor comes from roasting the tomatoes until they’re shriveled up and lightly dry and brown around the outside. Their concentrated sweet flavor is what makes this, although you could also chop up sun dried tomatoes in a pinch. 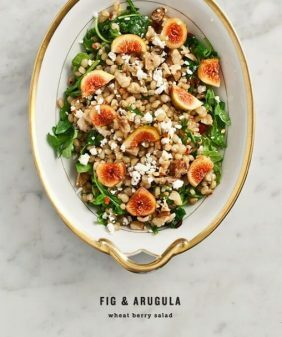 I cooked my eggplant simply in a pan with garlic and chickpeas (the chickpeas were my addition if you couldn’t tell)… and tossed it all with farro, arugula, basil and pine nuts. The best part about this salad is that it keeps well. 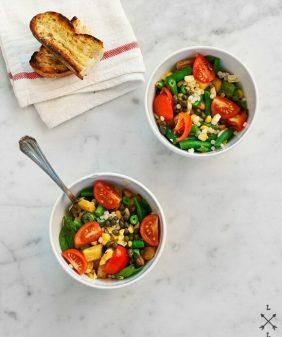 Make it ahead, serve it at room temp or store it in the fridge and have it for lunch the next day. I served my leftovers for breakfast with a fried egg on top – which is not the Italian way but it was so delicious that I recommend you do that anyway. 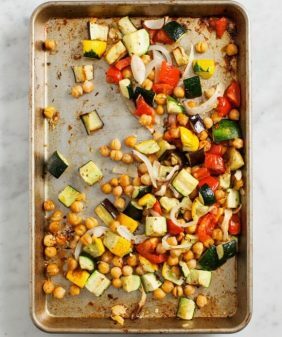 Preheat the oven to 300°F and line a baking sheet with parchment paper. Place the cherry tomatoes on the baking sheet and toss with a drizzle of olive oil and a few pinches of salt and pepper. Roast the tomatoes until they’re shriveled up and golden brown around the edges - about 30-35 minutes, depending on the size of your tomatoes. Bring a pot of salted water to a boil. Add the farro and reduce heat to a high simmer. Cover and cook for 30-40 minutes or until tender. Drain and set aside in a large bowl. 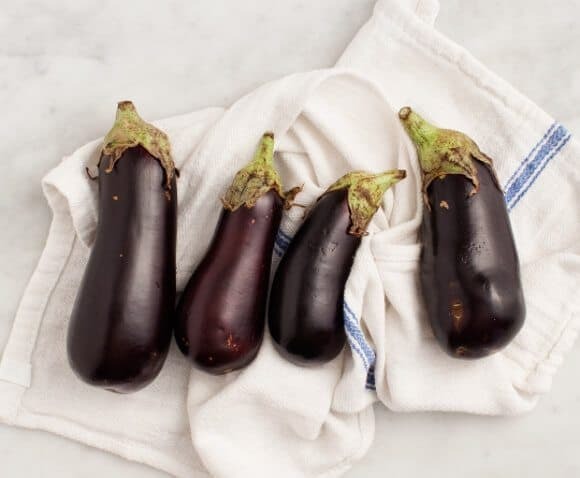 Chop the eggplant into 1-inch pieces and place on a paper towel with a few pinches of salt. Let it sit for about 20 minutes. As water releases from the eggplant flesh, pat it dry. (This is my shortcut. If you want to properly salt your eggplant this is a good video). In a large skillet, heat a splash of olive oil over medium heat, add the eggplant and cook until it’s tender and golden brown on each side, about 10-12 minutes. Add the chickpeas and garlic halfway through, along with a few pinches of salt and pepper. 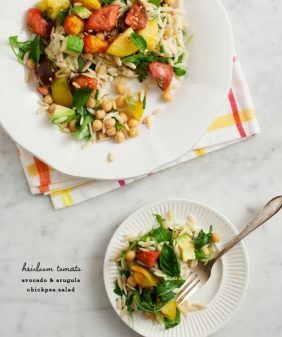 Add the roasted tomatoes, cooked eggplant and chickpea mixture, pine nuts, arugula and basil to the large bowl with the farro. Add a generous splash of sherry vinegar and toss. Drizzle with olive oil and season with salt and pepper (and more sherry vinegar if necessary), to taste. 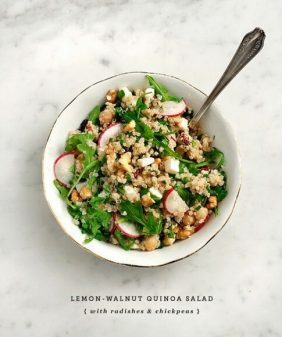 Make this gluten free by using quinoa instead of the farro. I grew a bunch of mini eggplant this year (cutest. things. ever.). Can’t wait to give this a try with those! This looks like the perfect end-of-summer salad. The ingredient combination is a classic for a reason – delicious! I try to do something similar- I carry around a small notebook with me and whenever I eat something delicious I jot it down. It makes for a memorable souvenir. Thank you for carrying around a travel journal, because this looks exactly like what I want to eat for lunch today. So wish I had made this for my picnic basket for tonight’s trip to the Hollywood Bowl! I liked the way you described your food journal…it would have been so easy to tell us that you had an elaborate journal with beautiful sketches, and detailed instructions. The real thing is much more interesting to me and I can totally picture your journal, and you squinting to decipher your writing. Yum – totally sounds like my kind of dish!! Love the idea of keeping a food journal when you travel … I eat so many delicious things that I would love to recreate that I should really try to follow your lead! It looks so fresh and delicious! This looks so perfect right now! I will definitely try this with fried egg on top, I’m taking your word for it 🙂 I think it will be lovely to try and roast the eggplants as well. I was searching for a new way to enjoy my eggplants,i got tired of how i make them,especially with the weather i just want something light and “salady”,this is definitely it! thanks for this.Also love the pics you take! This is to beautiful and fresh a dish for words – thank you for sharing! 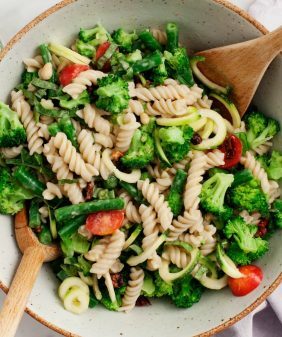 Made this with brown rice, sunflower seeds, roasted large tomato slices, zucchini, white beans, garden kale, and dried basil (aka on a budget)…still the same recipe? Anyway, it was delicious. Thanks for the inspiration!